Discussion in 'The Rehearsal Room' started by hellsonlyangel, Jul 16, 2003. Morceau Symphonique has long been a favorite with trombone soloists. Because of contrasting material the soloist has the opportunity to display excellent phrasing, tone and control. Alexandre Guilmant was one of the finest organists of his time. His compositions for organ were many and include two symphonies for organ and orchestra, eight sonatas and five sets of pieces. Guilmant was a French organist, teacher, composer, and editor. His early and unrelenting regime of practicing and composing led him to a position as organist at age 16, and his Messe Solemnelle in F was performed just two years later. Guilmant spent much time editing and publishing works of other composers, and his own music was greatly influenced by the likes of Liszt, Schumann, Franck and Saint-Saens. He concertized throughout Europe, Britain, and America, later becoming professor of organ at the Paris Conservatory, where he taught until his death. Most noted for his 8 organ sonatas and 2 organ symphonies, his Morceau Symphonique for trombone and piano was presumably composed as a contest piece for the Paris Conservatory. Thanks to its beautiful phrases and exciting allegro theme, it is a perennial favorite in the trombone repertoire. Lenthe has arranged this piece for trombone and brass quartet (2 trumpets, horn, & tuba), which he has also recorded on Marcophon CD 952-2. Perhaps we should state straightaway that Arthur is in no way related to the composer George Butterworth with whom he has sometimes been confused. He was born in Manchester on 4 August 1923. On leaving school he worked in a solicitor's office for a time before joining the Royal Engineers in 1942. On demobilisation, he entered the Royal Manchester College of Music (RMCM) in 1947, studying composition with Richard Hall for two years; also trumpet and conducting. As a student of Richard Hall - before Goehr, Maxwell Davies, Birtwistle and Elgar Howarth came on the scene - he was inculcated with the ideals of the Second Viennese School but soon rejected it as not being what he wanted to say. He had already written some pieces before entering the College and his first acknowledged opus, Now on Land and Sea Descending , a setting for contralto and orchestra of 'The Vesper Hymn' by Longfellow, was one of the pieces he submitted as evidence to the RMCM that he was suitable to be taken on as a composition student. This was eventually performed at a college concert and provided Butterworth with his first experience of conducting a proper orchestra, albeit a student one. Written for trombone, this has become known in some circles as Concert Piece. We have 3 recordings of this and all have imformative and individual programme notes. I'm sure the Morceau was written for a competition at the Paris Conservatoire sometime early in the 20th Century, might be worth checking up as well. Sorry can't be any more help. Morceau was on the Grade VIII Euph sylabus for a while. Most I've seen are bass and tenor. You might want to have a listen to the Lindberg recording as well. You might not like his style but the programme notes are good and the cadenza gives you food for thought (I copied it at a college recital once). The playing needless to say is excellent. thats cool thankyou soooooo much. now, just to keep you on ur toes do you know any background to napoli. its not that im not looking I've been looking all day, but have had no luck and im on the verge of giving up! its so famous there must be loads of stuf to say about it but at this moment im feeling very uninspired and extremely bored having been sat at this computer all day (pity me please). I think the tune 'Napoli' is also know as 'Finiculi Finicula'. It was written to 'celebrate' (?) a funicular railway, would you believe! The song was written by journalist Peppino Turco and was set by Luigi Denza in 1880. They drew the inspiration from the inauguration of the first funicular of Mt. Vesuvius. They composed this music in few hours, and in spite of that the song met with success. The famous melody was sang the first time in the rooms of Quisisana Hotel in Castellammare di Stabia. Turco and Denza presented it to the Piedigrotta's day in the same year. The success roused contributed to diffuse Neapolitan song in the world and to recall a lot of tourists. 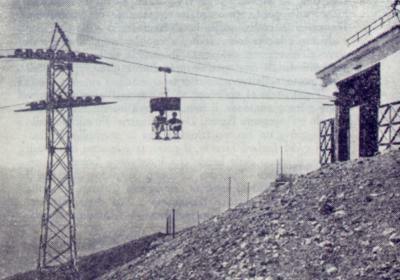 On 31 May 1961, the "Vesuvius Railway and Funicular Company" changed its company title in "Vesuvius chair lift and bus-line" and was controlled by Circumvesuviana. The plant could transport until 1000 persons daily. As the years went by, it became not much suitable to transport tourists, because unable to transport at the same time the numerous groups. From 1953 to 1984 the plant has almost transported 100.000 persons, half of which were foreigners. In 1984, for the reasons previously cited, the chair lift was stopped for ever. At present, Mt.Vesuvius can be visited by car. The road leaves near Ercolano's toll-booth of Napoli-Salerno motorway. I think the tune 'Napoli' is also know(n) as 'Finiculi Finicula'. An interesting snippet of useless information: When Richard Strauss wrote his tone poem "Aus Italien" he included variations on "Funiculi, Funicula", wrongly believing it to be a traditional melody. Didn't the Two Ronnies do a musical sketch with this Tune . . . ?